Once again I received a call from a local senior, Ed, interested in obtaining a reverse mortgage. Ed asked if he could set an appointment to talk about what he wanted to do. We agreed on a place, day and time, he preferred to meet at his home. Although I have an office, I prefer this as well. Meeting at a client’s home enables me to see any obvious conditions that may affect the value. Sometimes it can be as simple as an old water damage spot on the ceiling that has not been taken care of after a roof repair. I can head off these issues. I also can see if the home has had any recent updates that I may not have considered in my original expected value. There are many benefits to a meeting around the kitchen table. When I arrived it didn’t take long for Ed to pull out a huge UPS box of documents. I am sure at one time, probably when Ed initially opened the package, they were all neatly arranged and organized. However this was no longer the case. Ed had stacks of papers. 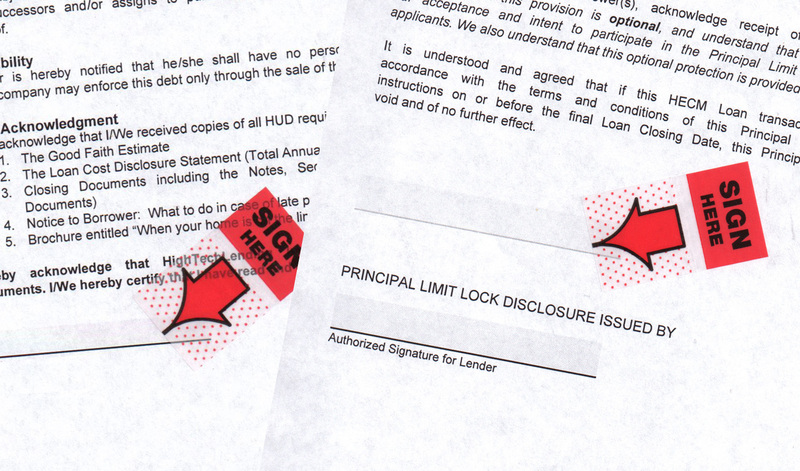 Many were marked with red sticky tabs imprinted with an arrow and the words “sign here”. Ed had followed the instructions as best he could, the package was overwhelming. Can you guess what Ed wanted me to do? Did you guess “explain the documents”? If you did, you guessed correctly. Ed had talked to his family about a reverse mortgage and one of his family members “loved” one of the spoke persons for a national reverse lender that advertises on TV. Whether it be Fred Thompson, Henry Winkler, Pat Boone or Robert Wagner, is not relevant. What really matters is that none of these celebrities will be coming to your home, talking to you on the phone or helping you through the process. There are many details involved in the process of a reverse mortgage, all of which take understanding and a professional expert who has originated innumerable reverse mortgages over many years. When I go to a clients home, I plan enough time to review the program, discuss the pros and cons, address all questions and explain every document prior to their signature. Absolutely no UPS box of confusing detailed instructions, dozens and dozens of sticky red arrows indicating a needed signature and a pre-paid return package with instructions to complete and ship back the following day. If my clients are undecided, that’s OK. I have had clients sign the documents on the first visit, this happens a lot. But there are also seniors that need more time, they need to discuss their plan with family, maybe they want a family member or financial planner to sit through a consultation. That’s great, I want to know they are comfortable and have no concerns or misunderstandings. 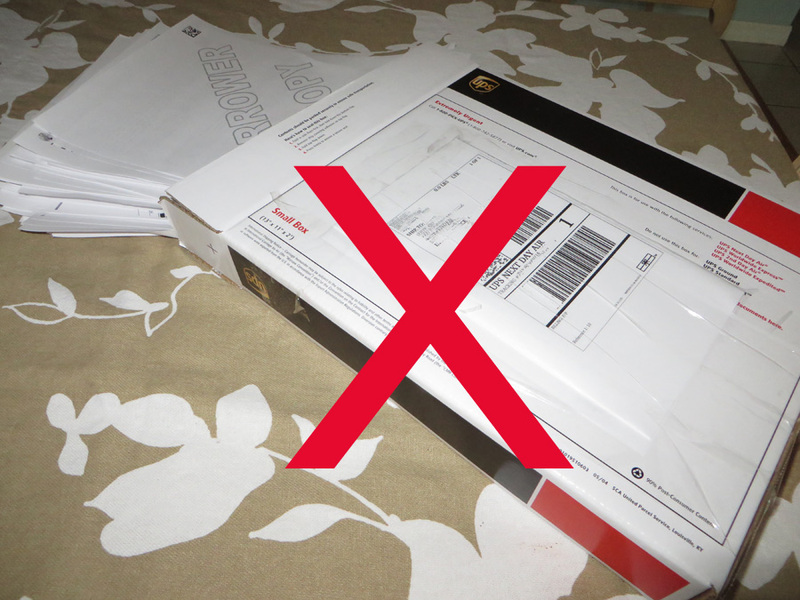 So what was the difference between the documents that arrived by UPS and the documents I hand delivered to the clients home? Number ONE, the celebrity package, had an unrealistic home value. It’s great to think that you may get a far more greater amount of funds, but it is also upsetting and discouraging when the appraisal is completed (which is a factor that determines the funds available) and it is at an amount much lower than anticipated. Maybe it’s much easier for a voice over the phone to present exaggerated numbers. But I’m here, living in the area, bumping into clients in unexpected places. Even running into a client at a restaurant on the evening of his marriage. Whether it’s at the local steak house, at Walgreens in the medication aisle or in the checkout line of Costco, I’m local and love seeing them again, whatever the circumstance. I’ve visited client’s in the hospital, gone to the veterinary emergency clinic to hold the hand of a clients daughter when they couldn’t get there and provided a much needed ride to pick up a rental car. None of this comes in a UPS box. When it came to the closing fees, my estimated costs, in this case, were $100 less than the other package and my package included an itemized fee sheet with each vendor listed. This was something I couldn’t find in any of the UPS box contents. So please let me introduce myself, “Hello, my name is Fred Thompson,” no that’s not right. “Hi, my name is Henry Winkler, you probably remember me as the Fonz,” oops that’s not it either. Robert Wagner? Pat Boone? No and no again. Hi, my name is Donna Moore. I am a reverse mortgage loan originator and local expert serving the west coast of Florida, Tampa Bay, Central Florida, including The Villages and I promise you that when you give me a call, it is my voice on the other end. Whether you call 727-831-3416 (Tampa Bay), 941-421-0205 Venice, Punta Gorda, Port Charlotte or 352-342-9292 from The Villages and Ocala, it is me that answers the phone.I will give you my personal service, expertise and time to understand your needs and goals. All that does not come in a UPS box. My personal website is http://www.asmartsenior.com/ I can be contacted through this as well. I look forward to hearing from you.